Two new designs with either brass ball top or urn top. Finished miniature stanchion stands just over 3 inches high. Brass 3" posts with turned 1" diameter domed bases. Burgundy or red velvet 6" rope sections with brass connectors. Set of 3 posts and 2 ropes. Posts and ropes can also be ordered individually. These miniature stanchions are hand-crafted from solid brass. Posts and rope are both true to life, making these very realistic. 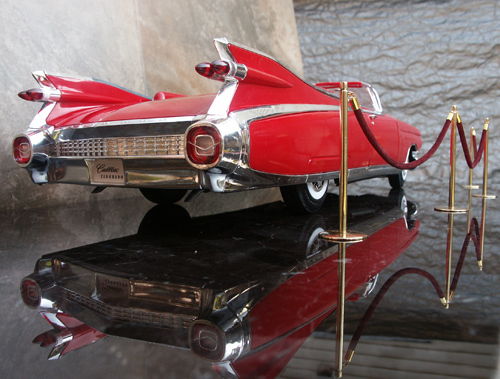 These miniature crowd control barriers are perfect for your miniature store grand opening, marketing event, or to keep onlookers from touching your vintage scale Cadillac. Please specify Ball or Urn top and choose burgundy or red velvet ropes when ordering. All prices are in USD.